You know how nice it feels to drive your car home after getting a tune up? The oil is squeaky clean, the fluids have been topped off, windshield wipers have been changed, tire pressure is at that perfect level, and it’s been washed inside and out? 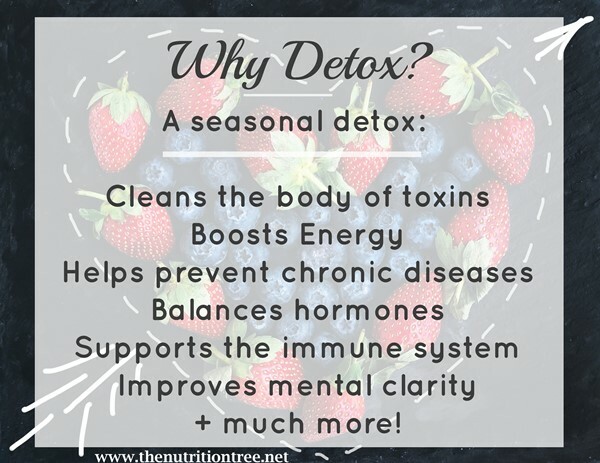 Well, just like our cars need a tune up, a seasonal detox allows our bodies to become shiny and new again too. It allows our body to reboot our metabolism, boost our immunity, clears the cobwebs from our minds, gives our skin a chance to glow, and allows us to lose weight effortlessly. Maybe you think that you will feel hungry or deprived. No worries, my friend, because I’ve created this detox so you can pick which level of detox adventure you want to go on. Having all these feelings are natural, but you know what is not natural? Feeling like we have to constantly count calories, not eat any fat, and go around in circles from one diet to the next. The thought of doing that for the rest of my life sounds just plain exhausting! There is no reason to be scared because you will NOT feel deprived. We are going to keep it simple and eat wholesome, nourishing foods. The only thing you have to lose is some unwanted poundage, dark circles and puffiness under your eyes, and that feeling of lethargy that has been dragging you down. You will discover your blueprint for the foods that work for your unique body. Check out all the details here! Register now and change your life forever!